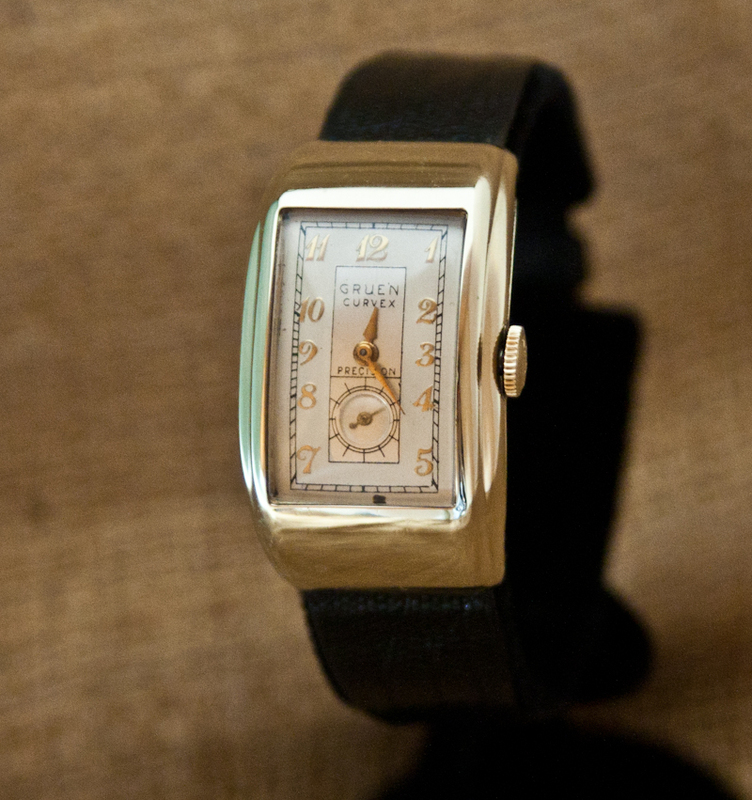 The Curvex Coronet is one of the most sought-after Gruen watches. 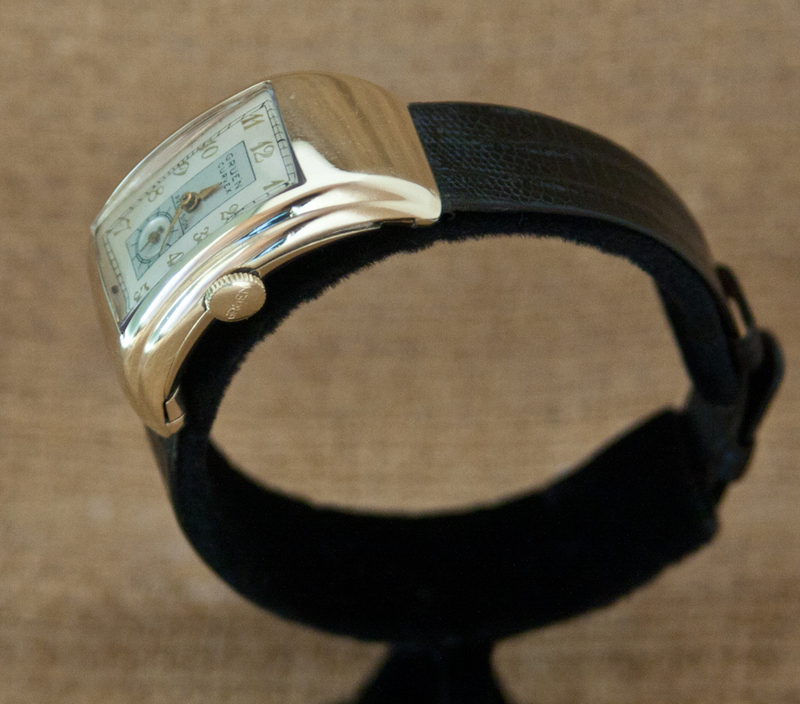 The radical curved design was Gruen’s take on the “driver’s watch,” some of the most fascinating, unusual and collectable wristwatches of the 1930s. This excellent example dates to 1938. The watch is all original, excepting only the crystal and the band. We recently had the watch overhauled and it is currently running strong. 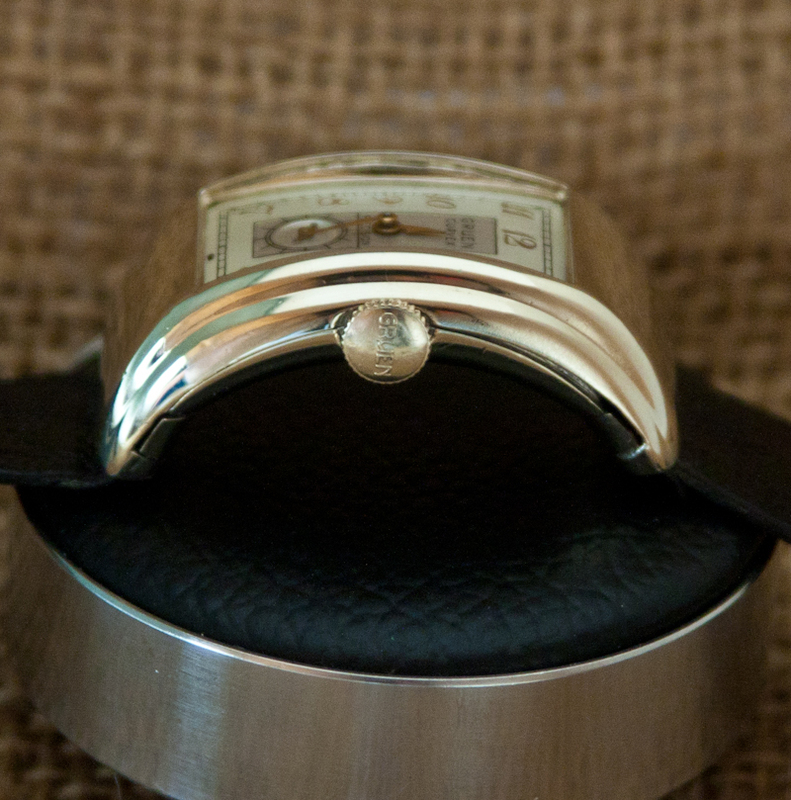 The Curvex Coronet is one of the most sought-after Gruen watches. The radical curved design was Gruen’s take on the “driver’s watch,” that is, a watch you wear on the side of your wrist for ease of reading while your hand is on the steering wheel. All of the major brands produced drivers’ watches before WWII, but the design faded after the war. 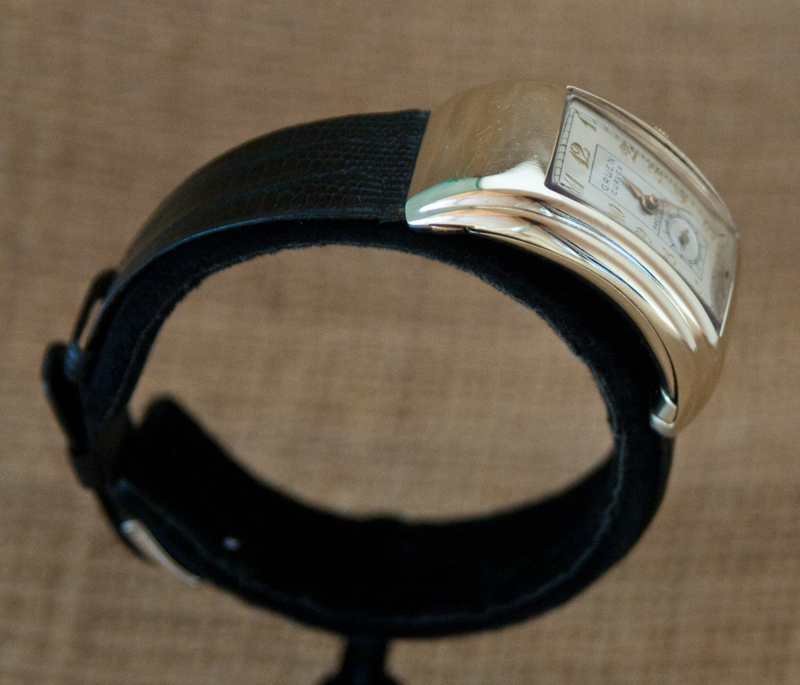 These are some of the most fascinating, unusual and collectable wristwatches of the 1930s. This excellent example dates to 1938. The unique u-shaped case design is made possible by the use of a Gruen Precision Curvex movement. This watch has the caliber 330, 17 jewel movement. The watch is all original, excepting only the crystal and the band. This is the original case, dial, hands, and movement. We recently had the watch overhauled and it is currently running strong. We have also added a new old stock glass crystal. The watch is in exceptional condition and ready to wear, or simply add to your collection. The case is 10K yellow gold filled and shows no brassing or wear through, indeed, the case shows extremely little wear of any kind. 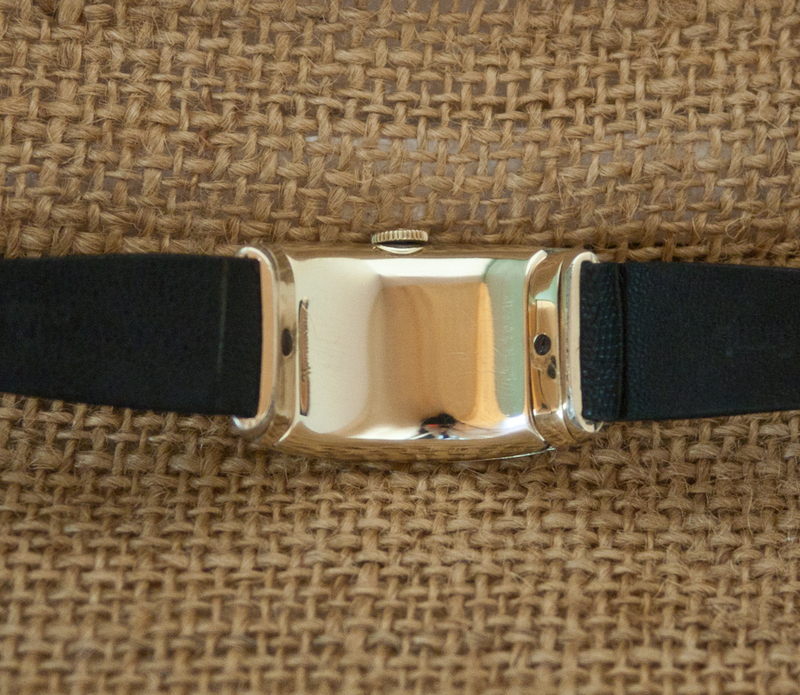 The band is a new leather band, custom fit to the case.